(Nanowerk News) As part of the Horizon 2020 EU-funded SOMA (Soft-bodied intelligence for Manipulation) project, researchers from the Technische Universität Berlin (TUB), Università di Pisa, Istituto Italiano di Tecnologia, Deutsches Zentrum für Luft- und Raumfahrt e.V. (DLR), the Institute of Science and Technology Austria, Ocado Technology, and Disney Research Zurich have experimented with the robotic handling of easily damageable and unpredictably shaped objects such as fruit and vegetables. The grippers were designed to handle the full 48 000 items stocked at Ocado’s - the world’s largest online-only supermarket - highly-automated warehouses whilst ensuring limited damage to a whole shopping list of fragile food products. As a result, to avoid damaging these sensitive items, the project used compliant grippers (i.e. ones that possessed spring-like properties) in conjunction with industrial robotic arms. 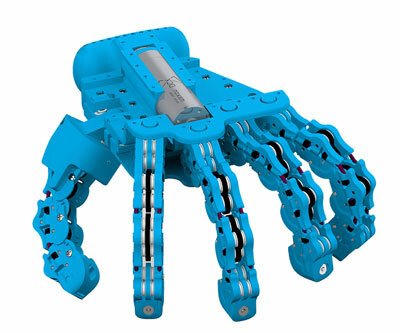 The anthropomorphic RBO Hand 2 gripper designed by the Technische Universität Berlin (TUB) for example, uses flexible rubber materials and seven individually controlled pressurised air chambers for safe and damage-free picking of objects. The design enables versatile grasping strategies as the fingers, palm, and thumb adjust their shape to the given object geometry (morphological computation). The team mounted the soft hand on two different robot arms, a Staubli RX160L and a KUKA LBR iiwa14. Both of these arms can operate in the standard position controlled mode. What is more, the KUKA provides the capability of demonstrating a certain amount of software controlled compliance in the arm. The experiments carried out on artificial fruit stored in an IFCO (International Fruit Container) tray revealed that the robotic handlers were able to successfully grasp a variety of shapes and that the chance of success interestingly increased when environmental constraints (e.g. the walls and the bottom of the tray) were being used effectively to restrict the movement of the object. Now that this international team has made a breakthrough in reaching their main goal of developing versatile, robust, cost-effective, and safe robotic grasping and manipulation capabilities, they now plan on throwing more complex items and constraints into the tray to see if the robotics arms have really grasped the new supermarket scenario. The SOMA project has received just over EUR 7 million to explore a new avenue of robotic manipulation, exploiting the physical constraints imposed by the environment to enable robust grasping and manipulation in dynamic, open, and highly variable contexts. It will run until April 2019.